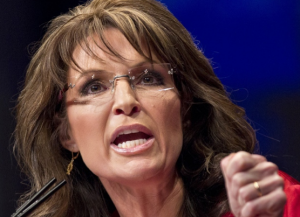 Katie Couric wants Sarah Palin to know her door is always open. “She has an open invitation to come talk to me,” Couric said in Orlando on Monday while promoting her new daytime talk show, which premieres this fall. Palin famously sat down with Couric in 2008 during her vice presidential campaign for a series of interviews that proved disastrous for the former Alaska governor, in which she refused to name any newspapers she read and touted her state’s proximity to Russia as bolstering her foreign policy credentials. The interviews were widely seen as a turning point for Palin, who was quickly lampooned for her answers and saw her popularity begin to plummet.